If you have come to the UK and you need to stay because you would be in danger in your country of origin or residence, and you want the UK to grant you international protection, you need to claim asylum. You claim asylum via the UK Home Office, the government department that handles asylum and immigration claims, as well as enforcing borders. The Home Office expect people to claim asylum immediately on entry to the UK. If you do not do this, the Home Office will use this to argue you are not really in danger. If you didn’t claim asylum as soon as you came to the UK, you will need to explain why you didn’t claim asylum immediately, and provide evidence of this where possible. Some people claim asylum immediately on entering the UK, at the port at which they arrive. They do this by telling the immigration officials there that they wish to claim asylum. If you do this, you will usually have your first interview to gather basic information about you and your journey – your screening interview – that day or in within the next five days. See Toolkit section on the screening interview. If you don’t claim asylum immediately on entering the UK, you will need to telephone to make an appointment to claim asylum at the Screening Unit in Croydon. This is the same for adults and children – in the case of unaccompanied children, however, they should have their “welfare interview” (the equivalent of the screening interview) locally rather than having to travel to Croydon if that is not the nearest Home Office branch. Read more in the Toolkit section on the Screening Interview. The exception to this process for claiming asylum is if you arrive to the UK in Northern Ireland – in this situation you claim asylum at Bryson House in Belfast. You cannot claim asylum at a police station – though in some cases people who make themselves known at a police station (particularly children) may be signposted to the Home Office. If you are picked up by immigration enforcement teams before you have arranged to claim asylum, you need to tell them you wish to claim asylum. Some time after your screening interview, you will then have your asylum substantive interview. This is the long, in depth interview where you explain why you would be at risk if returned to your country. Read more about the substantive interview, and how to prepare for it, here. The time period between the screening interview and substantive interview can vary. It can be many months, and some people wait as long as year. You may want to submit evidence to the Home Office at your substantive interview. If you have a lawyer, make sure you discuss this with them first. You also have five days after the substantive interview within which to submit evidence. Read what is meant by “evidence” here. You should be informed of the Home Office decision on your asylum claim within six months of your substantive interview. The Home Office says that it may take longer than this if your supporting documents need to be verified, you need to attend more interviews or your personal circumstances need to be checked (for example if you have a criminal conviction or you’re currently being prosecuted). If your asylum claim is refused, you may have the right to appeal the refusal in the courts. The first place you would appeal is the First-tier Tribunal. Read more about the legal process after a refusal here. If you have no or little income, you may be able to get legal aid to pay for the cost of getting legal advice. The government allocates funds for this purpose, and the legal aid fees are paid directly to the legal advice provider. If you claim asylum immediately or soon after arriving in the UK, you will usually be able to meet with a legal aid lawyer after your screening interview and before your substantive interview. You will not be automatically allocated a lawyer, but you can find out about your nearest legal aid law firm or law centre by asking at your asylum accommodation (see below). If you have already been in the UK for some time, you should try and see a lawyer before you claim asylum. You can search for a legal aid lawyer using these directories. Read more about legal aid, and alternatives if you are not eligible for it, here. If you do not have anywhere to live and you have no money to support yourself, you need to tell the Home Office this when you claim asylum. At this point of the legal process, you will be entitled to housing and a small amount of money, but you will have no choice where in the country you live, unless you have someone who will let you stay in their house. Asylum seekers in almost all cases do not have permission to work. If you work without permission, you are liable to criminal prosecution. If you are caught working without permission, you can go to prison. If you are destitute, you can apply for housing and basic living expenses – “asylum support”, which is administered by the Home Office. If you do not have the right to remain, you are liable to being held in immigration detention. The detention centres, known officially as “Immigration Removal Centres”, are like prisons. You can be detained at any time during your claim, but there are several points in the asylum process when it can be more likely to happen. 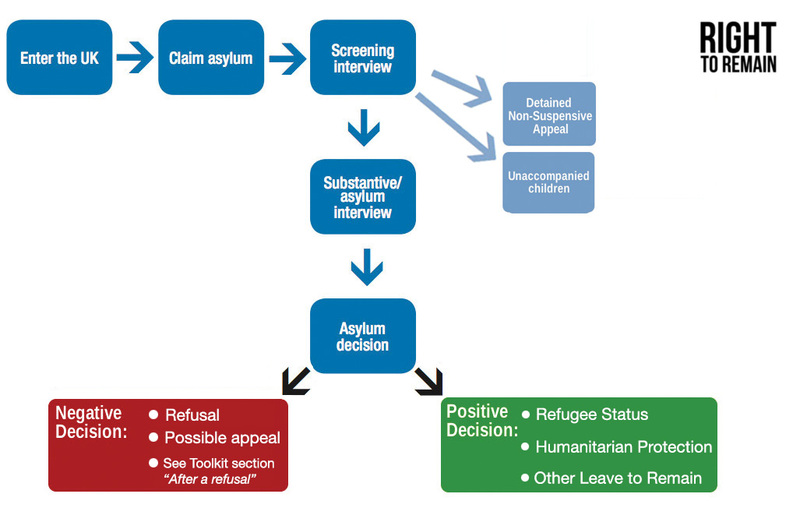 When you claim asylum, if your claim is deemed “clearly unfounded” you may be detained at the screening interview. Read more in Non-suspensive Appeals Section. When you claim asylum, if the Home Office prove you passed through another European (EEA) country they may try to transfer your claim under the Dublin regulations and detain you while they do this. Read more here. If you have been in the UK for a while and do not have regularised status (for example, if you have overstayed your visa), are picked up by immigration enforcement and claim asylum, you may be detained and your case placed in the “detained asylum casework” category. If your asylum claim is refused, you will have the right of appeal in the UK (unless your case has been categorised as “non-suspensive appeal” – read more here). Most people in the “detained asylum casework” category are released from detention before their appeal is heard. If you are not detained when you claim asylum, you will usually not be detained until after a refusal of your asylum claim and a dismissal of an appeal at the First-tier Tribunal (if you had an appeal right). This is when you are what the Home Office calls “appeal rights exhausted”. You may in fact still have legal avenues open to you, including further appeals. See After a Refusal section. Although the law states that you should only be detained if your removal/deportation is imminent, you can be detained indefinitely. The UK does not have a time-limit on detention. Start to make contacts in your new local area as soon as you can. It is very difficult to go through the asylum process without support. In the ACTION SECTIONS throughout this Toolkit, there are suggestions of actions that people around you can take, to help you get through the process. Most towns and cities in the UK to which asylum seekers are dispersed have community centres where you can meet other people seeking asylum, and volunteers who will be able to help and advise you. When you arrive in a new place, ask other people and look for these places, until you find one or more that you like. If you have not yet had your asylum interview, start preparing for it now. Most people who apply for asylum are refused asylum by the Home Office. Make sure you know what your legal options are if this happens. You may have the right to appeal the Home Office refusal of your asylum claim. Is there evidence that you were not able to get in time for your asylum interview, but can get now? Have good people around you who can support you. It is not a nice experience to be told by the Home Office, and maybe by the courts as well, that you are not telling the truth. With people standing by you in solidarity, you are more likely to be able to keep going, and keep fighting for justice in your case. Find out who your local MP is. Your MP will depend on the constituency you live in or have strong connections to. A constituency is an area of the UK where the voters elect one MP. You can find out who your local MP is, and how to contact them, at TheyWorkForYou.com. It’s never too early to start thinking about meeting your MP. If they already know you, they will be more likely to want to help if you go to speak to them when something has gone wrong in your case. It’s much more effective to meet them in person than to phone or email. You can meet them during their “surgery” where they meet members of their constituency face-to-face to talk about local issues. If you’re a member of a local group, you might like to invite your local MP to one of the group’s events. If you later approach the MP for help, your connection to that group may be a positive factor and may encourage them to help you.